Overall demand for executive talent remained strong across Canada in 2018. The tightening of supply was palpable and affected large swaths of the tech sector. Demand was relatively even across the C-Suite – Sales, Marketing, Product Management, Professional Services, Support, Customer Success, Engineering and CEOs, suggesting that the sector has grown with firms at varying stages in their evolution. Companies reacting to local shortages by setting up secondary even tertiary offices where supply of specialized talent is perceived to be higher. Toronto has been a major beneficiary. Companies that dawdle in hiring, lose. When hiring processes are cumbersome, the number of steps unnecessarily high, and attention to the hiring exercise ebbs and flows with the priority of the day, candidates will go somewhere else or stay where they are. Momentum matters in hot markets. Firms struggling to adapt to new market realities are paying the price. Private equity continues to provide liquidity opportunities for founders and playbooks for scaling these businesses. Firms such as Amazon, Apple, GM, Ford, UBER and many others are increasing their Canadian footprint. Large corporates continue to seek opportunities to participate in the tech sector. New divisions, new businesses being set up or spun out. As they build their executive teams, many of these firms are struggling to strike the ideal balance of entrepreneurialism needed to innovate with the large company sophistication needed to succeed. In areas such as the GTA, infrastructure has become a material variable. Traffic congestion/gridlock factors increasingly in candidate decisions. Roles in in one end of the GTA will simply not work for candidates who reside at the other end. The issue is becoming more pronounced. Large tech companies continue to structure compensation packages designed to make it difficult for smaller companies to lure away important staff – RSUs, retention bonuses are prevalent and genuinely hard to leave. Canadian companies continue to seek expats willing to return home. Currency exchange rates, taxes, and a hot US market make this a fanciful dream for many companies. That said, immigration/work visa challenges are affecting an increasing number of Canadians in the US creating opportunities. Attracting ex pats from Europe and Asia more plausible for some. In-demand executives finding themselves with multiple offers putting upward pressure on overall compensation packages and making it more difficult for firms to ‘close’ executives. Counter-offers are on the rise as companies respond to resignations with ‘mea culpas’, promises to do better and full court presses to hang onto their talent. Shortage of CEOs experienced in leading firms with revenues in excess in excess of $20mm. This is tied to Canadian sector’s propensity for early exits and an underdeveloped professional class of tech sector CEOs. Supply is further impacted by the ability of PE firms to buy talent and by the voracious appetite of firms such as Constellation Software which continues to hire CEOs into their mini-Constellation operating divisions such as Volaris and Vela and Perseus with mandates to build new verticals. Experienced CEOs they have many choices. For unproven CEOs or CEOs interested in moving to larger concerns, opportunities exist. Shortage of senior finance talent in the tech sector appears related to the emergence of the cannabis, cryptocurrency and adjacent sectors which have targeted tech sector sensibilities and experience. Opportunities abound for high potential finance execs (up and coming #2s) to move up. Acute imbalance of demand/supply for specialty areas such as data sciences and AI/ML. Firms continue to seek torturously rare combinations of skills – PhD level technical training, business sophistication, leadership and communications skills. On the financing front, excluding cannabis and biotech, 2018 was another busy year for Canadian Venture Capital financing with the total YoY amount invested increasing by approximately 47% from $1.9B in 2017 to $2.8B in 2018. While the total dollars invested increased, the number of companies funded fell from 479 (2017) to 362 (2018) as did the total number of deals 637 in 2017 to 444 in 2018. 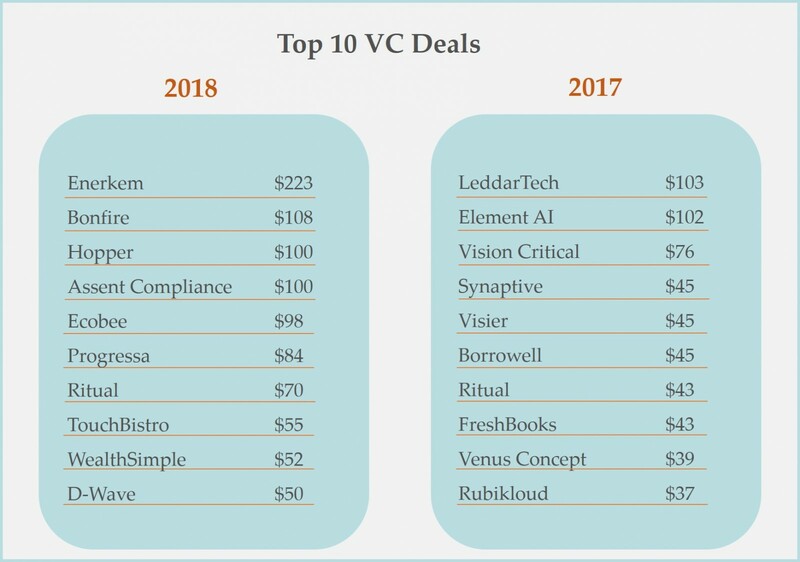 While the largest VC deal completed in 2018 for Enerkem at $223M was considerably larger than the largest 2017 financing for LeddarTech ($103M), generally speaking, 2018 saw VCs opting to do fewer deals, writing bigger cheques to fund fewer companies. Chart 1 below shows the top 10 deals per year with a higher concentration of larger cheques written in 2018 vs 2017. This year also saw a marked decrease in the number of exits with 1 completed in 2018 compared to 6 completed in 2017. Chart 2 provides a provincial comparison for 2018 to 2017. As one might expect while the median deal size increased in 2018, there was less activity in 2018 with the number of companies funded and the number of transactions completed lower. 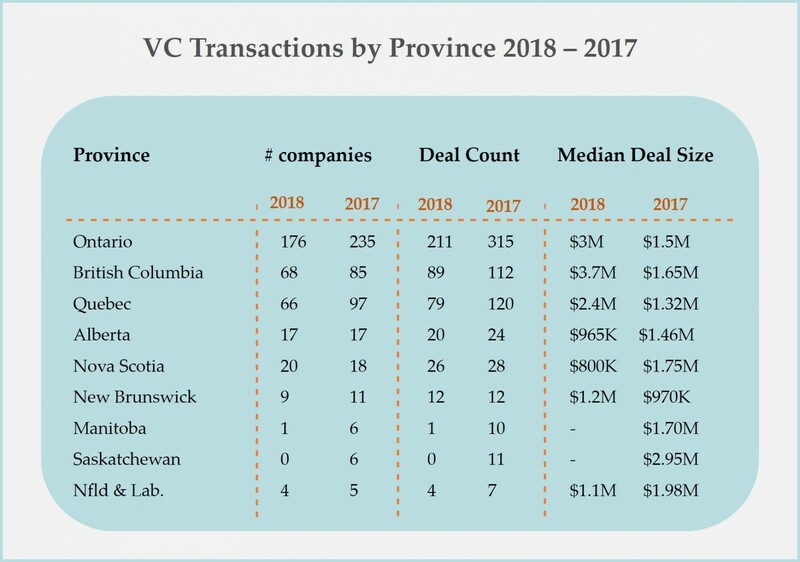 Ontario, BC and Quebec saw the most activity for both years with Ontario leading the way on deal size, number of companies funded and number of deals completed. In addition to the VC deals there were also major investment/hiring decisions by major corporations: Microsoft $570M over five years; Uber $200M; Intel opening a major research centre; Amazon adding another 600 jobs.